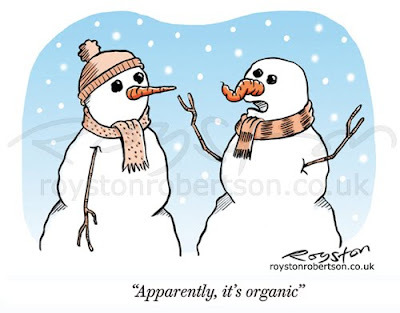 My wife tells me that the carrot is organic, which makes it a case of life imitating cartoons i.e. the one above which can be seen in the current issue of Prospect. 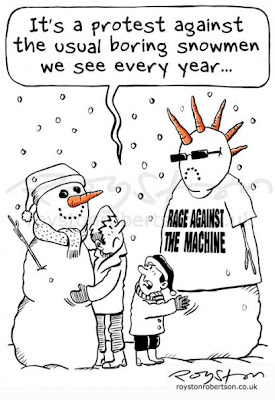 Talking of snowmen, I was commissioned by one of the Kent papers to do a snowy weather cartoon and somehow managed to turn it into a gag about Rage Against the Machine making it to the coveted Christmas Number One spot. The funny thing is, I already had a punk snowman, with a carrot mohawk, in my sketchbook from months ago when I was brainstorming Christmas cartoons. 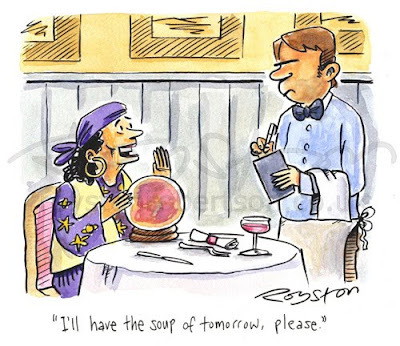 I liked the image but didn't know what to do with it as a cartoon. Until now. So the moral is never throw away old sketchbooks! I'm now taking a break from blogging until January 2010. All the best of the festive season to you. Have a good one. 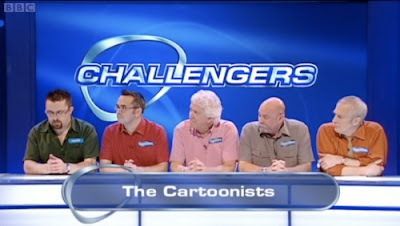 The main highlight of the year has to be being a member of the Cartoonists team on TV's Eggheads, especially as we won! 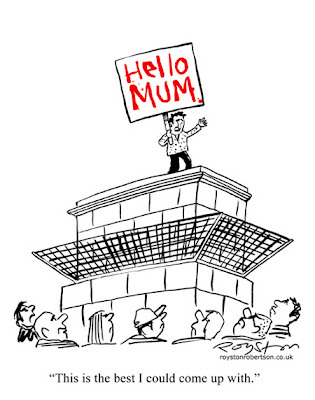 The Shrewsbury Cartoon Festival is always a highlight of the cartooning year. As is the Big Draw. It's always great when posts on the blog touch a chord with people. 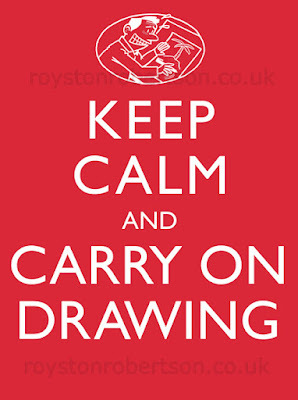 And If this isn't nice, I don't know what is and Keep Calm and Carry on Drawing, above, both got a good reaction. 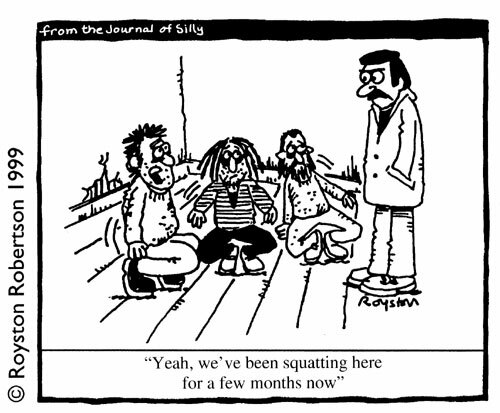 It's also good to get good feedback from published cartoons, of course, and inevitably this happens most with cartoons in Private Eye. The Picasso cartoon and Granny on drugs went down well, someone emailed me to tell me they carry a copy of the latter around with them to show it to people! 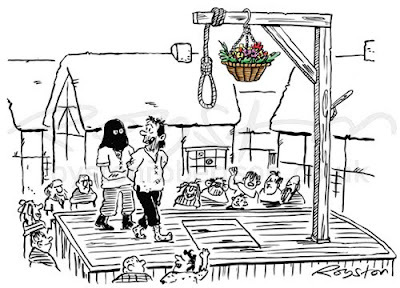 But the most astounding reaction was to the cartoon that appeared to show purveyors of organic food in a less than positive light ... 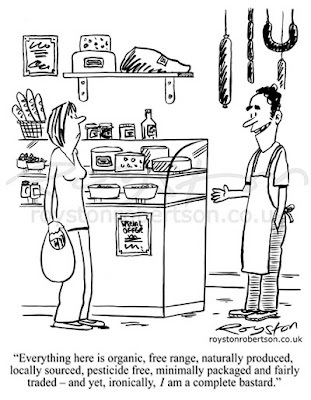 I sold many copies to owners of organic food businesses, deli owners etc. Go figure. Contributing to the PCO's Travelling Moleskine, which was organised by the Culture Vulture was fun. 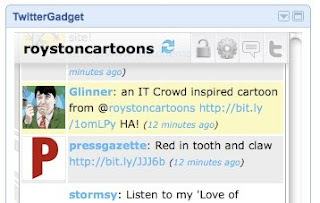 Getting a reaction to my IT Crowd-based cartoon from Graham Linehan, writer of the show, made me see there could be something to that Twitter lark. 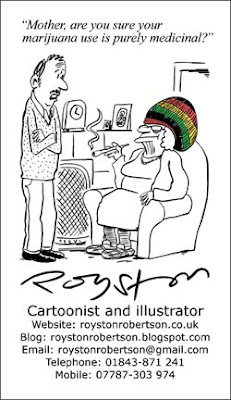 It was amazing to find out that there was once another cartoonist called Royston who I later found out was a woman. I was sent a book featuring her work so I was able to see her brilliant Disney cartoon and other more saucy stuff. 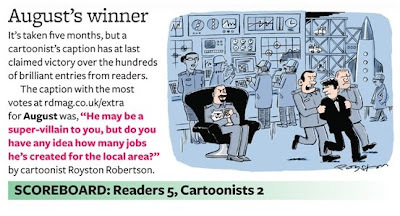 It was nice to be one of the few cartoonists to win the Reader's Digest caption competition. 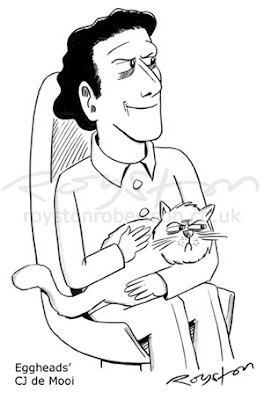 And a caption contest with a difference over at the CCGB website proved to be a fun challenge. Commission me in 2010, why dontcha? 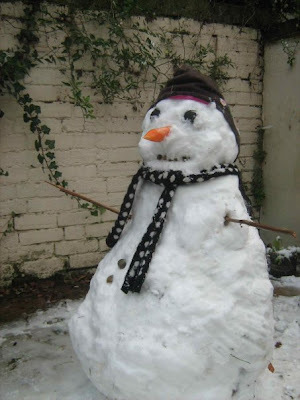 Apparently, lots of people here in the UK have snow today. 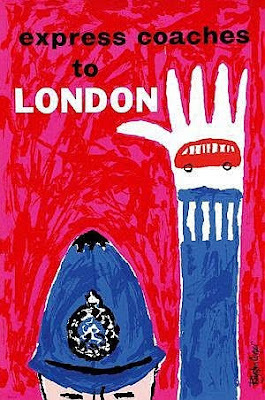 People in London appear to be getting particularly excited about it on Twitter. 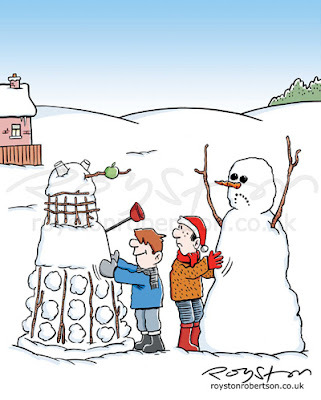 As usual, there is none here on the tip of the Kentish coast, so I have to make do with snow cartoons instead. This one can be found on a Christmas card in a gift shop near you (I sold the card company this and a slightly rude caption for a photo card). 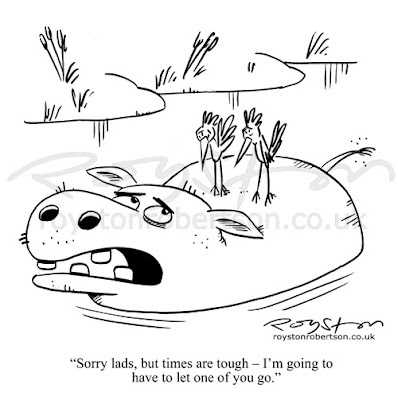 It can also be seen as a full-page cartoon on the back of the latest edition of Foghorn, the magazine of the Professional Cartoonists' Organisation. In other news: There's an interview with me over at a US blog called David Wasting Paper. 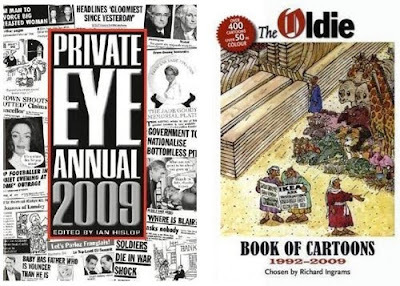 David is a self-confessed cartooning geek and has put the same questions to a whole load of cartoonists and comics artists, including Bill Griffith, Nick Downes, Dave Coverly, Chris Browne and Larry Gonick. There's lots to read there, well worth a look during the inevitable festive period down-time. 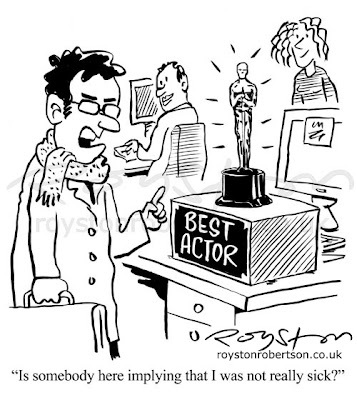 "Is somebody here implying that I was not really sick?" 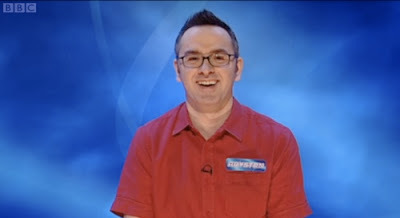 One of the best things about being self-employed is that you never have to make that humiliating phone-call where you put on a croaky voice and call in sick. 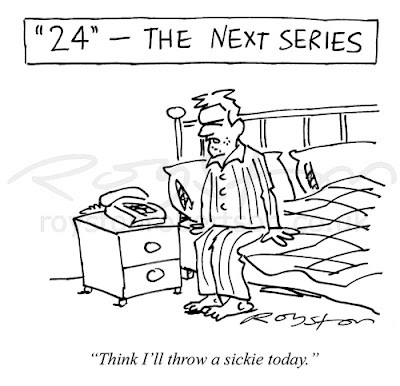 This cartoon was drawn to accompany an article about the number of working days lost to illness. Why do companies whinge on about this all the time? You're never going to get away from the fact that people get ill, and that there are some days when people just don't feel like working! I've never worked anywhere where they have "duvet days", but it sounds like a great idea. 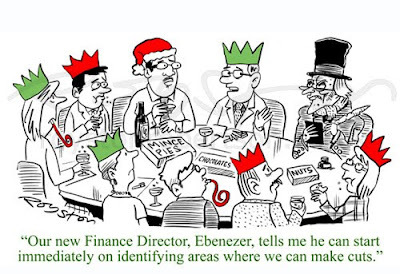 "Our new finance director, Ebeneezer, tells me can start immediately on identifying areas where we can make cuts." 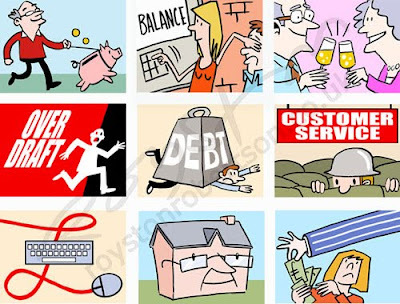 This year seems to have been characterised by cuts, redundancies and companies banging on about cutting waste. So when I was commissioned to do a festive gag in my ongoing series of boardroom cartoons, to be used as an Christmas e-card, it occurred to me to throw Ebeneezer Scrooge in there. He'd probably be seen as an asset to most companies these days. "Sometimes, Phillips, I just like to sit at home and look at the four walls." 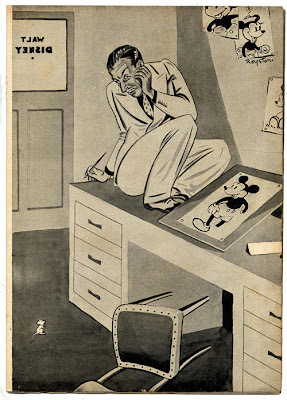 I managed to get round to scanning a few cartoons by the other Royston, the pseudonym of Victoria Cowdroy, who worked as a cartoonist in Australia in the 1940s. I posted her excellent Disney cartoon a few weeks ago, and here are three more. Like all the cartons from the 1941 Man annual, they're full-pagers, hence the captions appear small here. Click to enlarge. 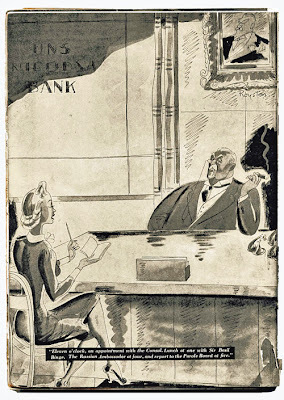 They're mostly in a "saucy" style, as above, though the one below appears to be making a comment on bankers, who were clearly held in as high esteem then as they are now. "Eleven o'clock, an appointment with the Consul. Lunch at one with Sir Basil Binge. The Russian Ambassador at four, and report to the Parole Board at five." This one, though is definitely in a more saucy vein. It's pretty racy stuff, as this couple have clearly been up to something naughty. 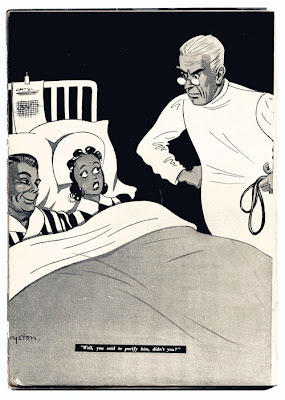 The look on the face of the patient is brilliant, although, slightly disconcertingly, he does look rather a lot like Ronald Reagan. "Well, you said to pacify him, didn't you?" 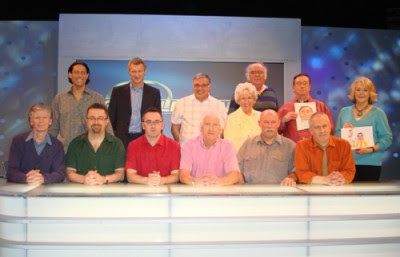 The bad crop, which turns Royston into "oyston", is the fault of the publishers, by the way, not my scanning. Thanks again to Denise Miles for sending me the book. 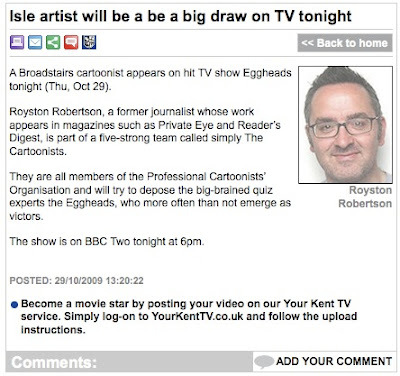 Click here for cartoons from the male Royston! I decided it was time for a new business card, as my existing one has an old email address on it and I'm fed-up of crossing it out. 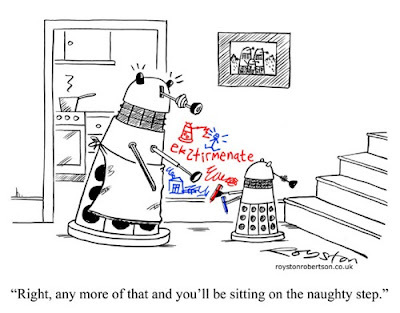 So I've just knocked this together, with a cartoon that appeared in Private Eye in the summer. Its shape allowed me to design the card in a vertical shape rather than the more traditional horizontal layout. This means I can get a lot more information in, so this card includes the address for this blog as well as my portfolio site. Once they're back from the printers I will no doubt thrust one into your hand, reader, should we meet. If you can't wait until then, feel free to print this off and attach it to some card from a cornflakes packet. 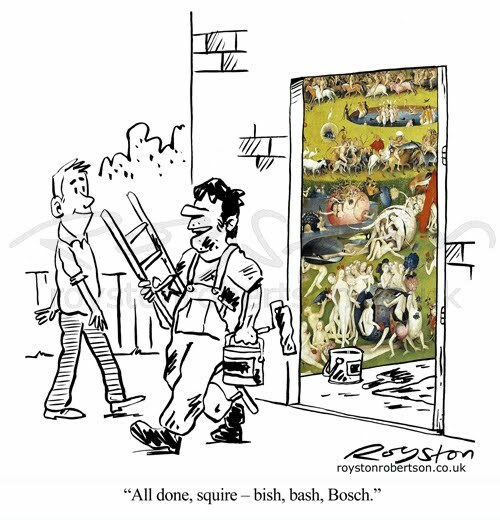 "All done, squire – bish, bash, Bosch." This is one many art cartoons I've drawn over the years, in an attempt to make myself look clever. 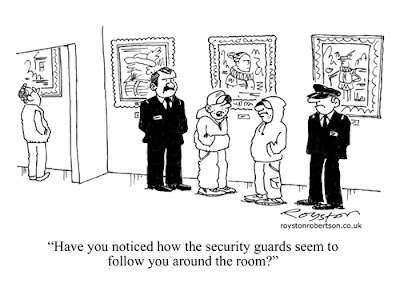 It's one of two gags by me that can be seen in the December edition of Reader's Digest. 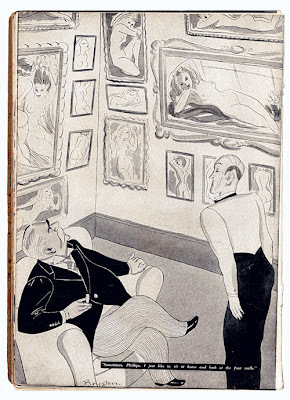 Often with art cartoons I'll draw an approximation of the original, as I did with this Picasso cartoon and this Magritte one, but here it seemed as though using the original would work better for the joke, as the decorator character is supposed to have painted it ... and would be a lot less work! You can see the full painting, The Garden of Earthly Delights (1503-4) by Hieronymus Bosch, in some detail here. It's almost like a bizarre cartoon itself, in all its wacky glory. I didn't put the usual "Apologies to ..." on this one as, well, it would have given the punchline away. 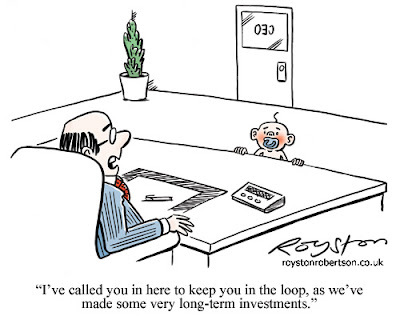 "I've called you in here to keep you in the loop, as we've made some very long term investments." 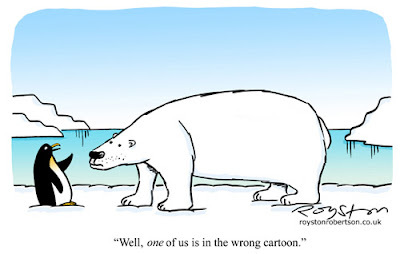 "You can never underestimate the power of a cartoon to get straight to the heart of the matter and say succinctly what it can take several pages to explain. This was brought home to me when I attended an annual summit and found Royston's cartoon from issue 33 (above) as part of one CEO's presentation." That could not be more on-message! Cartoons work. 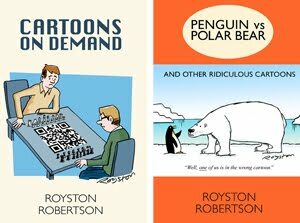 If you want to commission me, or to re-use any of my existing cartoons, email me on roystonrobertson [at] gmail.com. For more, visit my portfolio site. OK, I admit that I only know the poem because it was in a pop song years ago (Opus 4 by the Art of Noise). Anyway, it was a chance to do something a little different from the usual gag cartoon and I was quite pleased with the way it turned out. 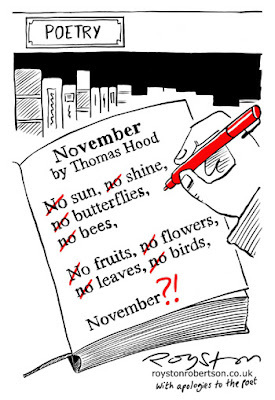 Having said that, I may have made a mistake, as looking online now I'm not 100 per cent sure the poem is called November. 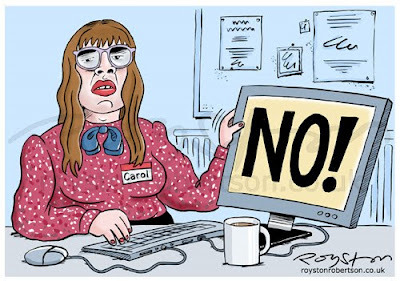 I've also found references to it as simply "No!". That would make sense, as the word November is really a punchline. Either way, this is of course just an excerpt from the poem. You can read the full text here. 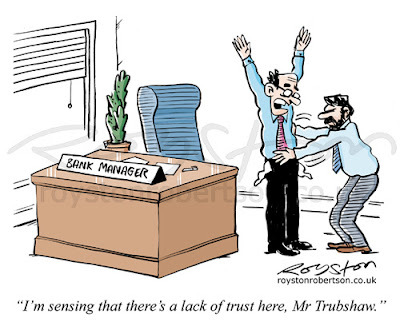 "I'm sensing that there's a lack of trust here, Mr Trubshaw." Here's a cartoon drawn for an international business magazine to accompany an article about how difficult it is to know what to do with one's money these days (I wish I had that dilemma!) what with the lack of faith in banking after the financial meltdown, the Bernard Madoff scandal and so on. 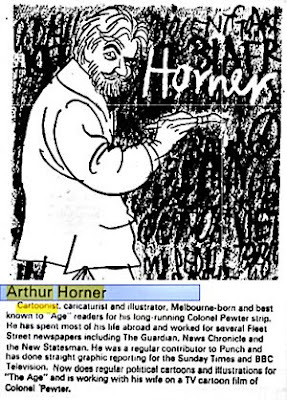 Regular readers will recall that I blogged about the Other Royston, who worked as a cartoonist in Australia in the 1940s and who turned out to be a woman working under a pseudonym. 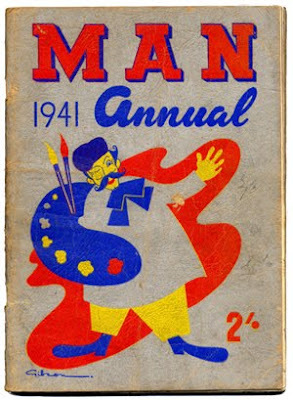 Well, Denise Miles, my correspondent in Australia who brought Other Royston to my attention, was kind enough to send me the 1941 Man annual in which she found the Royston cartoons. "I always like things to go where they will be enjoyed", said Denise, rather marvellously. And this certainly has been enjoyed by me today. 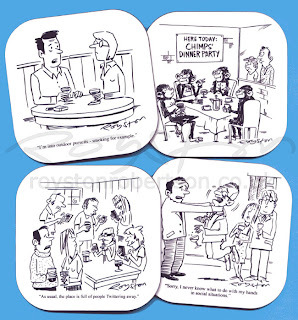 Each page (just under A4 size) is a full-page cartoon! Imagine something like that being printed today. And from the elegant cover by Jack Gibson, father of the UK's own John Jensen (who revealed to me that "Royston" was a woman) to the advert on the back, also by Gibson, it's beautiful artwork and cracking gags all the way. And there are loads by Other Royston (aka Victoria Cowdroy). My sincere thanks to Denise for sending me this, you made my day. Update 6.11.09: Here's another cutting, click it to enlarge. 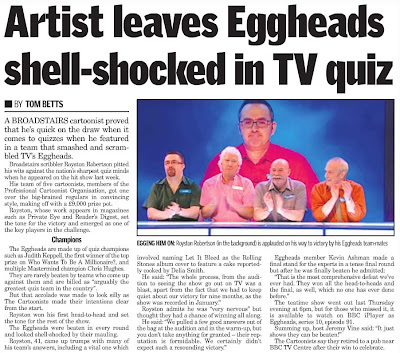 This appeared in today's Kent Messenger. More egg-based wordplay! 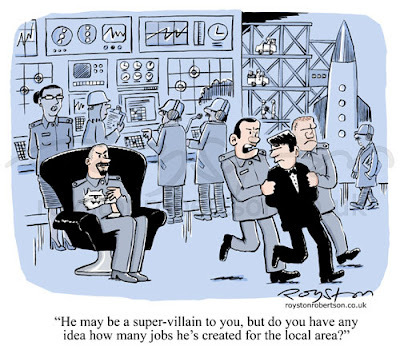 "He may be a super-villain to you, but do you have any idea how many jobs he's created for the local area?" 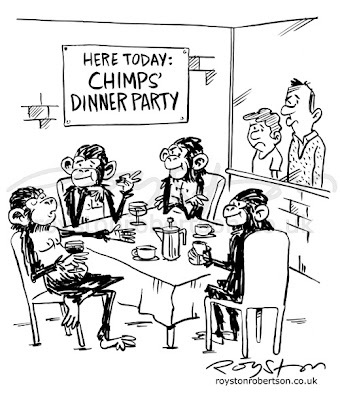 You many remember I mentioned that this cartoon of mine was the Reader's Digest "Beat the Cartoonist" drawing in the August issue. The idea was that readers submitted their captions, and the three best ones were posted on the website alongside my original wording, with no clue as to which was the original, of course. Visitors to the site were then asked to choose their favourite. 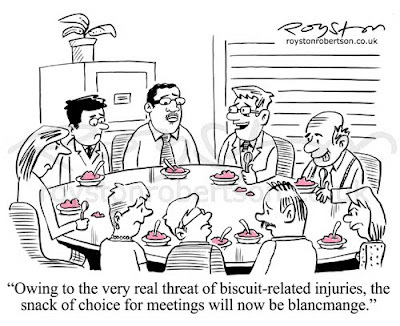 "Owing to the very real threat of biscuit-related injuries, the snack of choice for meetings will now be blancmange." 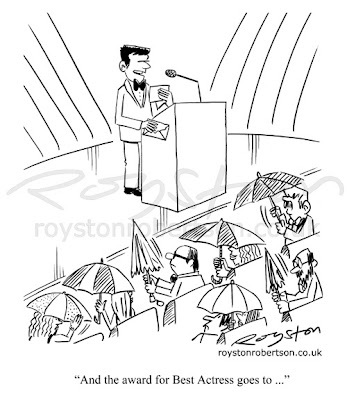 Anyhoo ... enough about the other cartoonist called Royston, here's a drawing from the current one (click to enlarge). 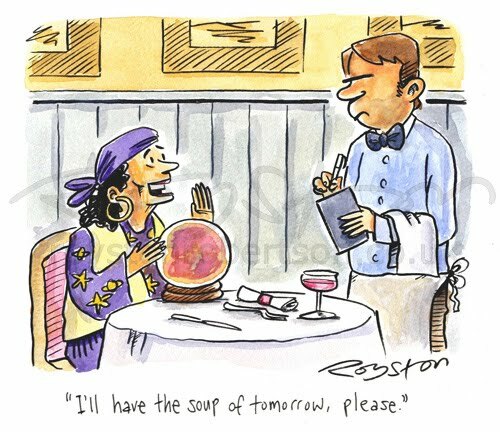 This is the latest in the boardroom series, which I draw regularly for a trade publication. It accompanied an article about the number of accidents caused at work by biscuits. It's quite a lot, apparently! 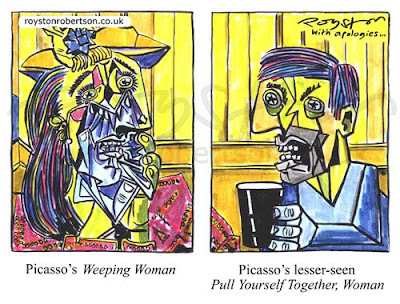 Picasso's "Weeping Woman", Picasso's lesser-seen "Pull Yourself Together, Woman"
It is traditional when producing cartoons based on works of art to put "After ..." followed by the name of the artist. Out of respect, this often takes the form of "Apologies ..." which I have used here. It's genuinely felt too, because I love Picasso's "Weeping Woman". It's an amazingly powerful work, particularly when you see it in a gallery. The painting is about bereavement in the Spanish Civil War, and I wondered whether it was a suitable subject for a cartoon. In the end I decided not to let my liberal guilt get in the way of a cheap gag! So here it is, and sorry again Pablo. 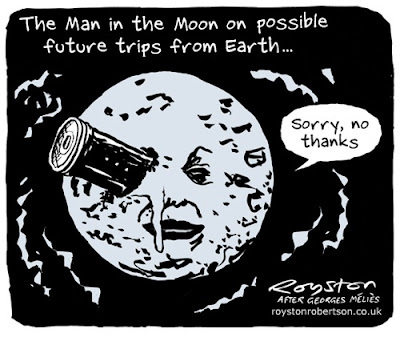 The cartoon can be seen in the current Private Eye. It was drawn with coloured brush pens, as I thought that would be better than using Photoshop. And yes, I used a lightbox to get the "Weeping Woman" right. It was quite a lot of effort to go to for an on-spec gag, much more than is usual, so I'm glad it sold.